The Pentax K-1 flagship is built around a 36.4-megapixel full-frame CMOS sensor, Prime IV image-processing engine and SAFOX 12 AF system with 33-AF points. Optimised for high-resolution stills, the weather-sealed K-1 comes without an anti-aliasing filter and is equipped with the company's latest Pixel Shift Resolution function, which uses the camera's 5-axis in-body Shake Reduction mechanism to deliver outstanding high definition and true-to-life, colour-accurate images . The K-1 features a magnesium-alloy and metal body design and offers high-speed shooting at up to 4.4fps, Full HD movie recording, a wide sensitivity range from 100-204,800, 4K time-lapse, Wi-Fi, GPS and Astrotracer functionality. 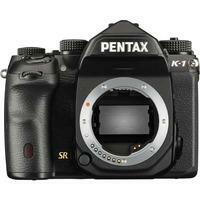 Pentax K-1 body, 4700 actuations, MINT! 6 month guarantee.